Developers no longer need to spend time sorting and searching for tests: the new and improved SmartRunner automatically sorts your tests for you, so that you see the relevant tests on the production code. Another new feature added at the request of our customers is the GetTimesCalled API, which helps check how many times a method was called so that assertions can be specified based on that number. This simple API provides more testing flexibility as well as higher precision for special testing situations. To make life even easier, Typemock Isolator V7.4 has also introduced new keyboard shortcuts, re-running, re-debugging, and test windows now automatically open as you navigate to them. This is in addition to dozens of new improvements. Unit testing has long been proven as the most effective method to lower code vulnerabilities, caused by legacy code and code decay, as well as substantially minimize bugs by helping programmers identify and prevent them in the coding stage. 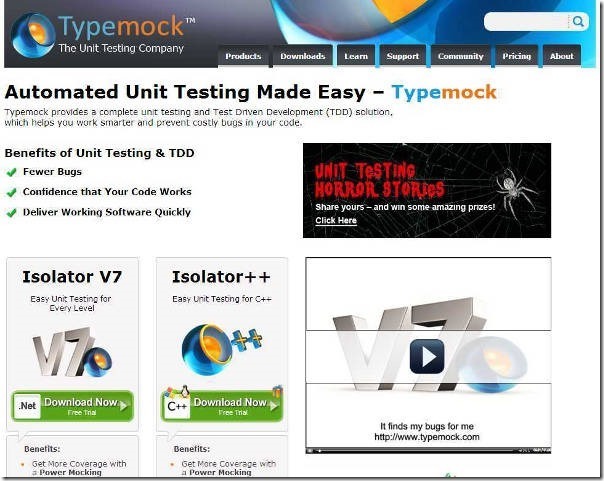 Typemock Isolator unit testing solutions have taken this further by automating the once manual process, allowing developers to easily and methodically test their code, including legacy code, and safely introduce changes to it.